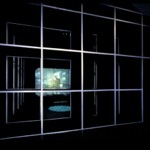 Rafael Lozano-Hemmer - Project "The Able Skin"
The Able Skin is a media structure designed by architect Emilio Galiacho to hide any emblematic building that is not allowed to have a natural death, that is kept alive artificially through restoration, citation and simulation. A virtual reality installation allows participants to tour the first Able Skin, which covers Palladios Villa Rotonda. 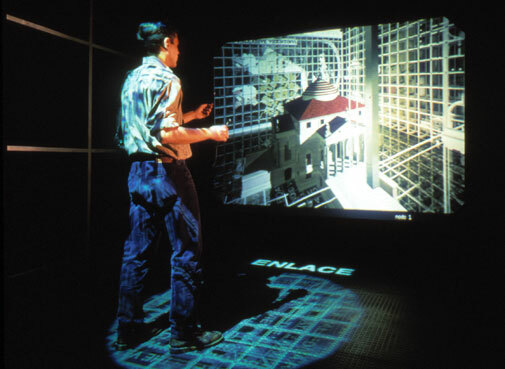 The participant's motion controls the point of view in the projected environments on the wall and the floor. 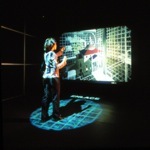 Keywords: indoor, sound, projection, tracker. Next Festival, Karlstad, Sweden, 2000. Art Futura '99 Festival, Sevilla, Spain, 1999. 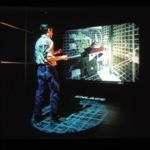 Arte Virtual, Realidad Plural, Museo de Monterrey, Monterrey, México, 1997 - 1998. Festival Internacional de Info-arquitectura, MOPU, Madrid, Spain, 1997.